One of the most festive events of Chester's Overture to Christmas is the St. Luke's Christmas Tea and Sale. Saturday, December 1st, Willard Hall will be filled with the sounds, smells and surprises of Christmas. Beginning at 11am through 3pm, there is something for everyone. Delicious light sandwiches and scrumptious sweets cover the tea table where your choices of coffee, tea and hot spiced cider are poured by a hostess. You fill your plate more than once for $8 (youth 6-12 for $4, and 5 and under free). Come join friends at inviting little tables festively decorated to eat and chat. Beforehand or after lunch, you can shop at Grandma's Attic for little collectibles, check out and choose handmade ornaments and Christmas decorations, and take home some specially baked goodies from the bake table. There are always pleasant surprises like quilted pieces, painted items, candles and other crafts and art. You can stay as long as you want. 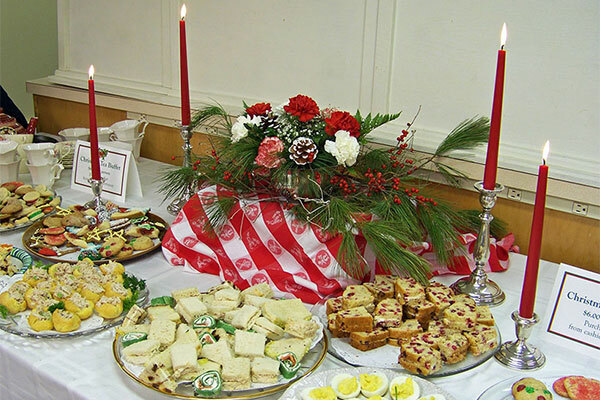 Call a dear friend and make a date to attend the Annual Christmas Tea at St. Luke's at 313 Main Street in Chester. Visit www.stlukesepiscopalvt.org for directions and information.